During the holiday break, I embarked upon the daunting task of organizing my entire house. What an emotional feat it was to purge the things that I no longer needed, while forging through all of my things, as well as my kids’ belongings, going from room to room and categorizing like objects such as baking supplies (flour, sugar, measuring cups, etc). To make my organization projects easier, I also went to the Container Store and purchased elfa drawers which have handy plastic cases that allow you to label each drawer, so that you know what clothes go where. It is so freeing to have items organized this way and to give everything in your life a place that makes sense and is easy to remember. The key to staying organized is being disciplined to put things away, as you go, so that by the end of each day when energy is low, there is less clean-up to worry about. For instance, one day my son forgot to put his shoes back on his new elfa shelf, causing us to feverishly look for them one morning and delay our schedule. I realized at that moment the value and benefit of knowing how to categorize like objects. 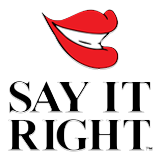 The experience got me to think about my students with language disorders. Many of them struggle with categorizing objects and words. Without being able to organize myself, I realized how debilitating this deficit is, not only in terms of communicating with others, but in organizing your everyday life–your desk, home and the clothes in your room. The discipline and systems to stay organized are the foundation for your life. Do you and your students need some help with organization and categorization skills? 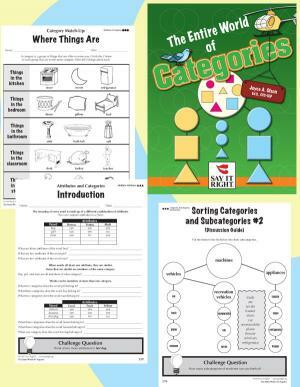 The Entire World of Categories is a great resource that provides a framework to teach basic vocabulary strategies to language disordered children and adults, giving them the skill of grouping like objects together and defining attributes so that the brain begins an organized filing system. Categorization is essential for word retrieval, stating attributes when attempting to retrieve a word you cannot think of during speech, and finally, organizing your life. Categorization is an important skill that cannot be stressed enough. In this day and age, disorganization seems to be the rule in many households. It’s no wonder why some of these difficulties persist.